After extensive research and testing products, I can say with complete confidence that PolyScience is one of the best, if not the absolute best, culinary technology companies out there. Everyone knows the best company for culinary technology is PolyScience. PolyScience is known worldwide and has again and again proven itself by marketing award-winning products and having excellent customer service. They are also known for their specialty in Sous Vide cooking. They have made great products such as the breakthrough PolyScience CLASSIC. It’s perfect for people of every skill set. 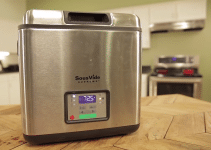 There are so many great sous vide immersion circulators, but this is one of the best. It has an endless number of remarkable features and it comes from such a reliable and innovative company you know it’ll be amazing. Even though you’d expect PolyScience to provide great products, you’ll still be caught off guard with how amazing this one is. It far surpassed all the expectations I had and I think it’ll exceed yours too. What makes the PolyScience CLASSIC one of the best, is its effectiveness and durability. It can heat up to 30 liters, or 8 gallons, of water to a precise temperature and keep it there. By using a controlled, precise water bath, it’ll give you consistent results and enhanced flavor with perfect texture. The easy to read back lit screen provides set and actual temperatures, which are always extremely close. The PolyScience CLASSIC also has auto-pump regulation. 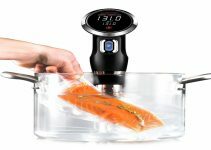 Auto-pump regulation makes this product extremely effective and ensures the water is evenly heated, the most important part of sous vide cooking, throughout the entire cooking process. Adding to its durability is the high-quality stainless steel heating coil and pump. The PolyScience CLASSIC is guaranteed to last you a long time with consistent results. What sets this immersion circulator apart, though, and makes it better than many others, is it’s easy to use design. Clips it right onto any pot or tank and you’re good to go. It also features easy to use one-touch control and three preset temperatures to choose from. The three preset temperatures make it easier for you since you won’t have to try to choose from a variety of temperatures. These are the perfect temperatures for any food you want to cook. It can be overwhelming when shopping for an immersion cooker, especially if you’re new to Sous Vide, because there are so many options, but you can’t go wrong with the PolyScience CLASSIC. 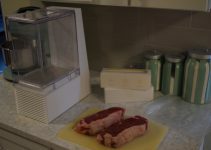 Whether you’re just starting out in sous vide cooking, or are a professional, it is perfect for all your needs. I love using this for side dishes like potatoes and green beans. It is perfect for keeping them warm while you cook the other food without drying them out or overcooking them. Its effectiveness, durability, and easy to use design make this the perfect immersion circulator. It’s personally made cooking easier and more rewarding and you’ll fall in love with it too. 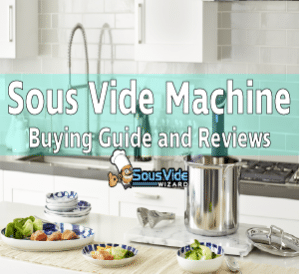 You’ll want to use it every day and with the many Sous Vide cooking books on the market, you might just be able to. There are endless recipes and possibilities and all you need to get started is this little device.